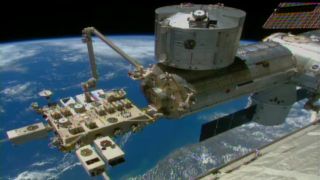 This video frame shows a robotic arm on the International Space Station, called the Japanese Experiment Module Remote Manipulator System, installing NASA's Cloud-Aerosol Transport System (CATS) on the orbiting lab's Japanese Experiment Module on Jan. 22, 2015. Two robotic arms recently completed an unprecedented handoff in orbit, attaching a NASA laser-firing instrument to the exterior of the International Space Station. NASA's Cloud Aerosol Transport System (CATS) instrument arrived at the orbiting lab Jan. 12 inside the unpressurized trunk of SpaceX's unmanned Dragon cargo capsule. On Jan. 22, operators on the ground used a NASA-controlled robotic arm aboard the station to remove CATS from Dragon, then passed the experiment to a Japanese-controlled arm. CATS is now powered on and going through checkout procedures. When it's operational, the instrument will use lasers to measure the global distribution of clouds and the tiny particles that make up smoke, haze, dust and air pollution in Earth's atmosphere. CATS' data should help researchers improve their climate-change models, mission team members have said. CATS was just one of many science payloads brought up to the station by Dragon, which launched atop SpaceX's Falcon 9 rocket on Jan. 10. Another experiment, for example, included a set of fruit flies that will be put under artificial gravity to better understand how the human body fights infections. Julie Robinson, NASA’s International Space Station program chief scientist, assured reporters in a prelaunch news briefing that any holes in the fruit flies' container are too small for them to fit through. "It's sealed up tight enough so those flies can't get out," Robinson said Jan. 5 of the "fly cassette," a small habitat for the fruit flies that also contains food for them to get the energy they need. The cassette also includes built-in lights to simulate Earth's daytime and nighttime, allowing researchers to get an accurate sense of their behavior. Flies, flatworms and NASA's atmosphere-spying CATS armed with lasers are riding SpaceX's CRS-5 Dragon cargo delivery mission to the International Space Station. See the weird science on SpaceX's fifth Dragon delivery explained in this infographic. The artificial gravity will be created using a centrifuge, and is required to help researchers isolate the effects of weightlessness from other aspects of the space environment, such as increased radiation levels. If necessary, the centrifuge can be modified to simulate the gravities of the moon or Mars, other destinations NASA plans to target. Dragon also carried up planarian flatworms, creatures that can rebuild their organs and nervous systems if they are damaged. Included in the experiment are intact worms, as well as other ones that had their tails or heads removed immediately before they flew into space. The animals' regeneration processes will be studied in space before the flatworms are returned to Earth to see how they performed compared to flatworms on our home planet. The goal is to better understand how gravity influences the growth of tissues, especially when it comes to the body stitching up its own wounds. Flatworms (and fruit flies) are considered "model organisms" that help scientists better understand the human body, Robinson added in the briefing. "We use all of those as information to help us understand how living organisms work in general, and how humans work in particular," Robinson said. Hundreds or thousands of model organisms can fly to the orbiting lab at a time, providing a much larger sample size than that provided by human residents of the station. A set of student experiments also flew to the space station aboard Dragon. The experiment set, known as Yankee Clipper, will examine things such as how crystals grow in space and how microgravity affects the way milk spoils. SpaceX holds a $1.6 billion contract with NASA to fly 12 cargo missions to the space station using Dragon and the Falcon 9. The Jan. 10 launch kicked off the fifth of these flights. Dragon will stay attached to the orbiting lab until Feb. 10, when the capsule will return to Earth in a Pacific Ocean splashdown.